Last night was the inaugural night of my new secondary 'outpost' in the polder at De Wilck (see previous post here), now Cospar 4354. I spent some 3.5 hours there, observing the Perseid meteor shower, and satellites. I arrived at 00:15 CEST (22:15 UTC). It was quite clear at that moment and I counted a limiting magnitude of +6.5 in the zenith. While setting up and waiting for two Iridium flares (Iridium 14 and 72) thin ground-fog appeared however, which would come and go the next 3 hours. As a result the limiting magnitude dropped between 0.1 and 0.4 magnitudes. The layer was thin, the top at perhaps 1.5 to 2 meter only. It didn't really hamper observations, even though the limiting magnitude dropped a bit. Following this I started my meteor observing, interrupted by short breaks in order to catch Lacrosse 5 (05-016A), IGS 4A/R2 (07-005A) and the IGS 4r (07-005C). Lacrosse 5 (05-016A) was nice and bright (from +2 to +1.5) when ascending in the southwest, and did it's infamous disappearance trick again at 22:54:35 UTC. Following this it shortly re-appeared at 22:56:08 UTC for only a few seconds at about mag. +3.5. Thirty minutes later, the IGS 4 rocket (07-005C) was observed. It produced a short bright surprise flare to mag. -1 in Umi at 00:42:00 UTC, fading rapidly after that. Three positions were obtained. A couple of strays were seen while observing meteors. 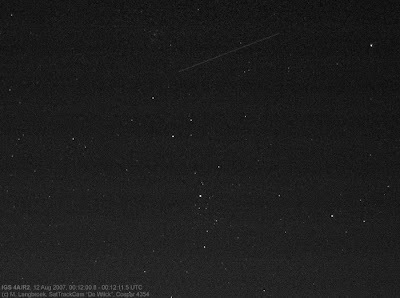 A weird stroboscopically flaring satellite (multiple flashes per second) moved near alpha And at 23:15:00 UTC. Another satellite flared to -2 and shortly after that again to 0 at 00:26:00 UTC near Polaris. This was my first meteor session since illness forced a stop 4 years ago, and it felt great to be out under a starry sky again, watching meteors. The location turns out to be adequate and quiet. And even with ground fog, conditions still were reasonable. Hence, I will certainly return more often here. I did note however that I am still not fit to do an entire observing night. Having started the meteor session at 22:35 UTC, I stopped at 1:30 UTC because I was starting to feel very tired (and still had a 25 minute bicycle ride to do). 2.28 hours of effective observing time with limiting magnitudes between +6.4 and +6.1 yielded me 130 meteors, 90 of which were Perseids. 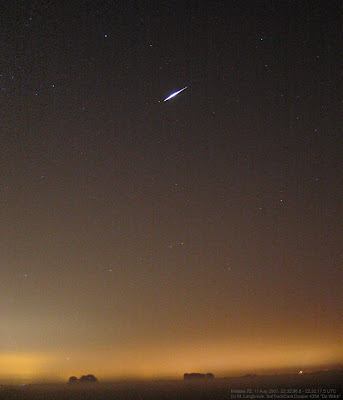 The meteor activity was nice, but they were rather faint, with not a single fireball among them. The kappa Cygnids were recognizable too, and I logged two delta Aquariids. 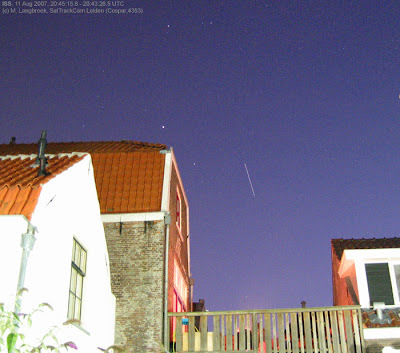 Before biking to De Wilck, I shot images of the 20:45 UTC ISS pass in twilight from my home (Cospar 4353). ISS was bright, around mag. -4 in the zenit. 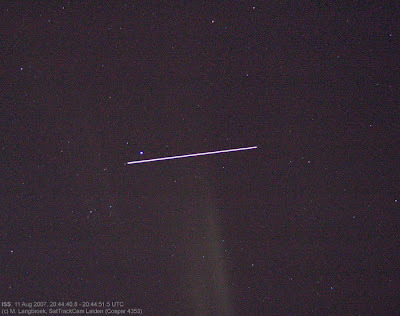 I also observed USA 193 (06-057A) but the trails on the two images are very marginal. They contain a faint stray too (which I still have to identify when I am less tired).